Hurricanes that intensify rapidly—a characteristic of almost all powerful hurricanes—do so more strongly and quickly now than they did 30 years ago, according to a study published recently in Geophysical Research Letters, a journal of the American Geophysical Union. 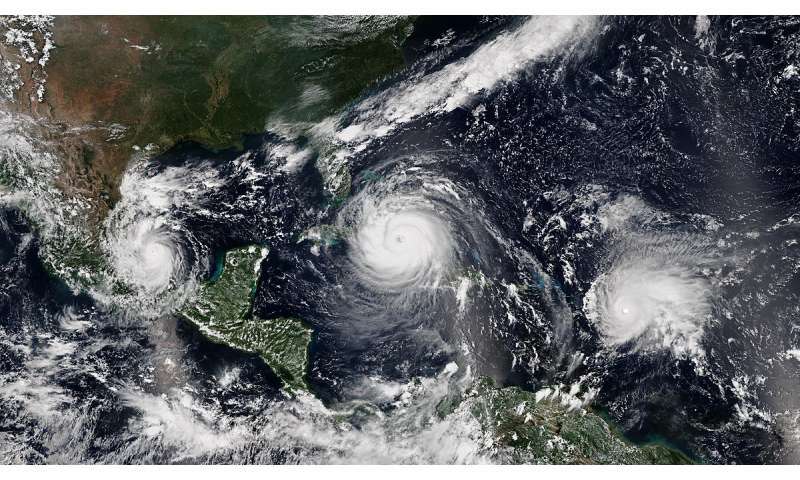 Last year's lineup of powerful storms—Harvey, Irma, Jose and Maria—spurred the scientists to take a close look at the rapid intensification process. This occurs when the maximum wind speed in a hurricane goes up by at least 25 knots (28.8 miles per hour) within a 24-hour period. It's a rite of passage for nearly all major hurricanes, including the big four of 2017. But the scientists also looked closely at just how much the storms are strengthening. They found a sizeable jump in the strength of fast-growing storms—the storms are getting more powerful more quickly within a 24-hour period than they were 30 years ago. The team found that the average boost in wind speed during a 24-hour intensification event is about 13 mph more than it was 30 years ago—on average about 3.8 knots (4.3 mph) for each of the three decades studied. Wind shear: The less the vertical wind shear—the difference in the direction and force of the winds at the surface compared to several miles into the air—the more powerful the hurricane can become. The AMO has generally been "positive"—causing warmer waters—since the late 1990s. what a bunch of made-up nonsense. "The cycling occurs for reasons scientists don't completely understand, but it has broad effects on the environment." right. "The result comes in part from analyses using 16 separate climate models to isolate the impact from global warming." oh, sure, that sounds like sound science. Excerpt: The team found, however, that pre- and post-industrial values didn't agree and, in some cases, that there was even a difference in sign (that is, one model yielded a positive value while another yielded a negative one). That indicated they could not model pre-industrial clouds using measurements that have been collected in a post-industrial world. "It's very curious. With greenhouse gases, climate sensitivity doesn't change over eight hundred thousand years. It works. Why don't clouds?" Ghan said.